We are in the process of purchasing our home. We've lived here nearly four years and have been renting. Sadly, our amazing landlord passed away last year. 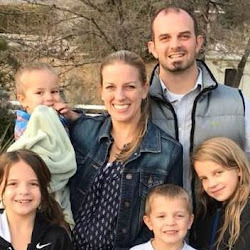 Just a few months ago, his family offered the house to us for purchase and we said "yes"! We are actually supposed to close on the house tomorrow. This past week, my sister in law came over and we white washed the fireplace and then removed a huge builders mirror that hung over the fireplace. The mirror has been the one thing that I've absolutely HATED about my living room (besides the awful grey striped wallpaper-notice it in the picture above on the right of the fireplace), and it was the most exciting thing to get rid of. White washing the fireplace has given our room the most amazing change and feel, and it was so incredibly easy. 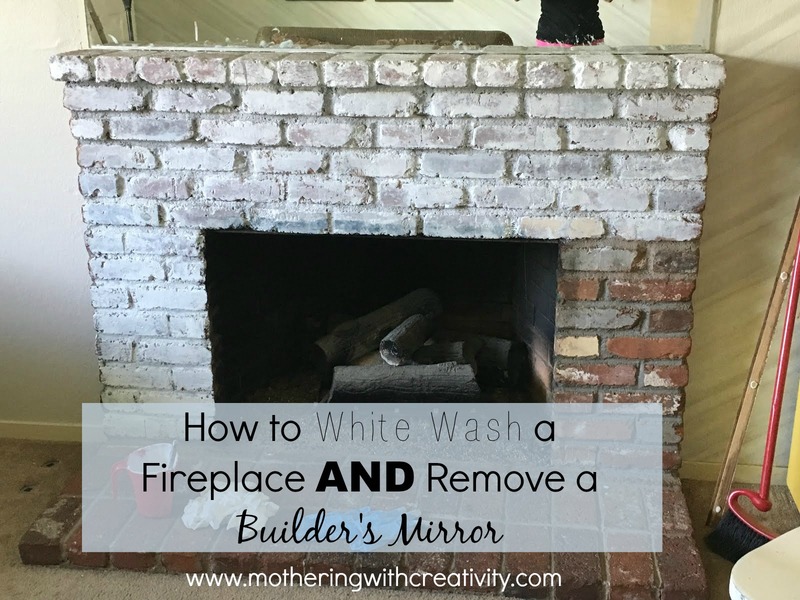 Since we did these two projects together, and I took pictures of both projects at the same time, this is a two-in-one tutorial: "How to White Wash a Fireplace" and "How to Remove a Builder's Mirror." White washing is very simple. You can use any white colored paint you have. We used a latex white paint. It is not flame retardant, however, so you'll want to stay away from the inside bricks of the fireplace. We removed the front, brass (hideous) cover from the fireplace, and then swept and wiped down the bricks with a damp cloth before beginning. In a bowl or cup, add about 2 cups paint to 1 1/2 cups water. Mix well. Using a paintbrush, brush on the paint onto the bricks. Be sure to wipe off the excess paint into the cup, as the watery paint will drip. After painting on the paint, immediately blot off excess paint from the bricks. We wore gloves and I bought Viva paper towels (super thick) to do the blotting. Jenny painted it on, I followed and blotted. We only did one coat and were satisfied with the results. Next was the mirror. We removed the wood framing from around the mirror. Then, using duck tape, and then painters tape when I ran out, we taped up the mirror forming "x's" and squares. The tape helps hold the pieces of the mirror together when it will inevitably break. Because we had lots of littles around the house, we wanted to keep any and all mirror pieces contained well. We decided to cover the top of the mirror with trash bags to catch any pieces that might have wanted to fly. Then we grabbed our glasses and started to pry from the back of the mirror! Our mirror popped off in three pieces. The big one was pretty heavy, and if you are removing a large mirror like this, I suggest having a second person help you. These types of mirror are glued to the walls, and they're made to STICK well. You will probably find that it pulls off some of the drywall paper stuff (technical terms aren't my specialty here). It looked pretty sad behind the mirror, but not nearly as ugly as the mirror had been. Some putty to fill in the holes, sanding, and spray on texture solved our problems! If you're holes happen to be small, you could get aways without the spray texture. We really tried to make it work, but in the end, there were just too many big flat spots and we added texture. Lastly, paint! We painted the wall above the fireplace. You can see our awful wallpaper to the right of the fireplace. Nearly our entire house is wallpapered, and so we are taking it bit by bit. The wallpaper comes off amazingly easy, but then we have to sit and scrub the glue before we can paint. While I was teaching on Saturday, Ben scrubbed the rest of the wall to the right, and we finishedpainting on Saturday afternoon. It already feels like a whole new room and all we've done is to remove the wallpaper and the mirror, paint one wall, and white wash the fireplace. We are slowly chipping away at painting the other walls, and we're replacing the far-gone blinds this afternoon. Eventually, we'll add grey laminate wood flooring throughout this room and the adjoining kitchen, as well as new thick baseboards and crown molding. It's a lot of work, but each little bit is thrilling and makes such a big difference! I look forward to showing you the rest of our house progress!